Hi Everyone... it's so nice to have you stop by and visit us on the RRR blog today! I have a fun and easy project that you can do to use up lots of the ribbons that you have or you can even order more from the Really Reasonable Ribbon store to make for all those cute little baby girls in your life. If you didn't know it already, RRR has some really fun little ribbons that are elastic like and are great for making baby hair bands. They are super soft and come in lots of patterns and white too. I used the light blue and pink ginghams and the white to create mine with. All you have to do for these is measure your sweet baby girls head and cut the ribbon and then stitch it by hand or sew it together to make a circle. 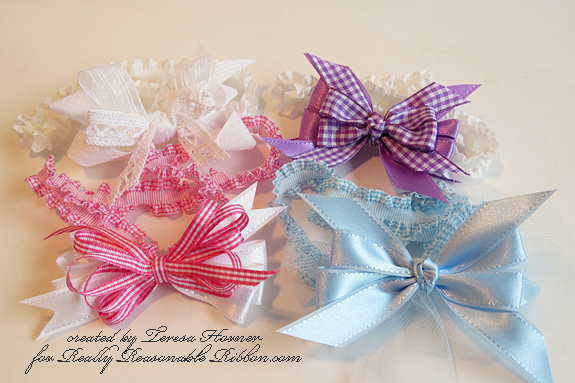 Then pick some of your favorite ribbons like I did and make lots of pretty bows to attach to them. And you can be really creative by mixing and matching or just by using the same color scheme. It was super fun and they went together really quick. Here is a closeup of a double bow with a knot in the center. I always tie my bows together with thread first and then tie the knot in the center and glue it on the back over the elastic tie to finish it. I think it gives it a good finished look that way but you can also add a button or rhinestone too. 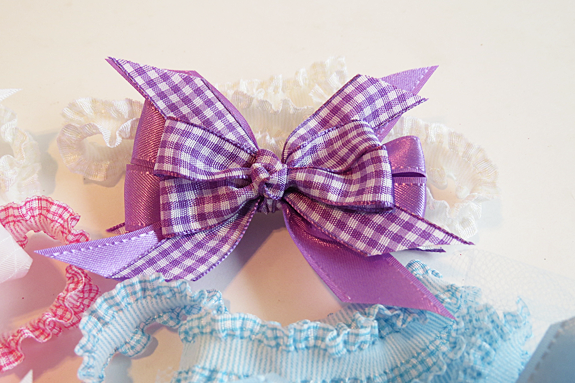 Satin w/Grossgrain edge, Diamond Satin Ribbon, Gingham Ribbon, July Ribbon Club Assortment. Aren't the ribbons just so pretty?